If you’re disappointed with the amount of traffic you get from Twitter then you’re not alone. Although Twitter has more than 328 million people using the service every month, a lot of online business owners say they only get a trickle of traffic from Twitter. These 51 tips on how to use Twitter for business will turbocharge your Twitter account and get that little blue bird working for you at last! The first thing to do, is plan what you’re going to tweet. That starts with working out who your Twitter account is aimed at. Do you want to find new customers? Or do you want to make new contacts in your industry? Once you know who your audience is, you need to deliver value to them with your tweets. What’s the Perfect Length for a Tweet? You keep up with the news and developments in your field, right? So why not share the latest news with your Twitter followers? When people hear something interesting from you first, it establishes you as someone with their finger on the pulse, someone who knows what’s happening. Breaking the news helps you establish yourself as an expert in your field – someone people can trust. And people like to do business with people they trust. You don’t have to be the first person to find or publish the story – as long as your followers hear it from you first, you’ll get the benefit. Reward your followers for their attention, by giving them special offers on Twitter. People like to feel special, and they love to save money – so create a discount or offer that’s exclusively for your Twitter followers. A time-limited offer also trains your followers to pay attention to your tweets – and rewards them when they do. People know the public face of your brand. If you’re doing a good job of advertising and marketing your business, they’re familiar with your logo, your website and your products. But it’s always fun to catch a glimpse behind the scenes. Tweeting a photo of your team, or your workplace or some event or forthcoming product is another great way to make your Twitter followers feel special and connected with your brand. Just be careful not to reveal more than you intended – double check what’s showing on any screens in the photo – and what’s happening in the background! Images are critical to success on Twitter. There are now so many photos getting posted that tweets without images are easily overlooked. In fact, according to Brandwatch.com, tweets with images get 150% more re-tweets, 89% more likes and 18% more clicks than tweets without. So illustrate your tweets with images – it will make your account much more engaging to visitors. Of course you can’t just take any image you find on Google Images – you have to respect copyrights and only use images that you have a licence to share. With more than 300,000 images, and contributions from 50,000 photographers, there’s a wide range of high quality images available at Unsplash. 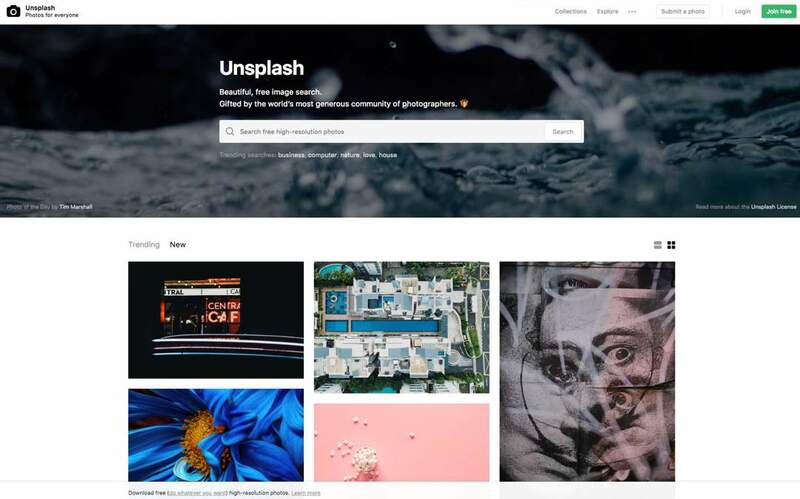 The standard of photography at Unsplash is very high – and many of the photos are “artistic” in composition, rather than typical “stock-photography style”. All their images are free to use, even for commercial purposes. Another great source of high quality images that you can use freely. Pixabay photos have a more “stock-photography” style than Unsplash, which can make it a great place to find photos for commercial applications. You’ll also find vector clip-art and even video clips. Photographers uploading images to Pixabay have waived their copyright so you’re free to use them. You may want to use the SafeSearch feature to return only family-friendly images. Watch out for images with Shutterstock watermarks at the top of search results – these are sponsored images and not free to use. 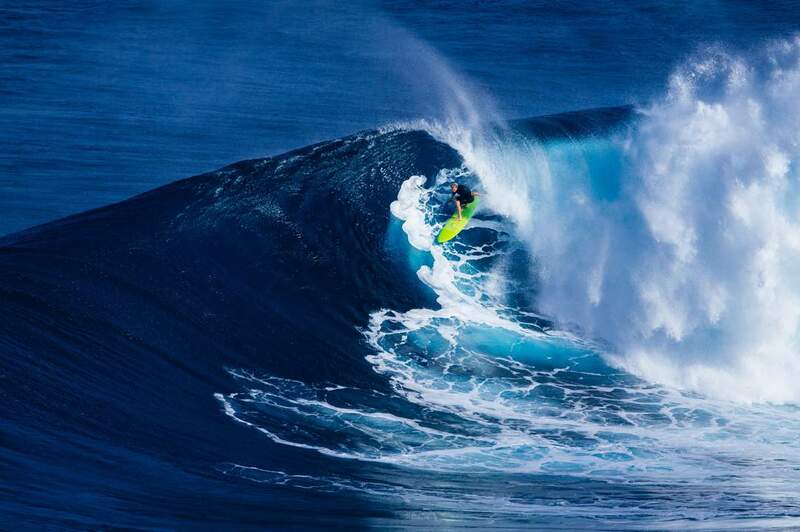 The popular photo sharing site Flickr can be a great source of images to tweet – provided you use it correctly. 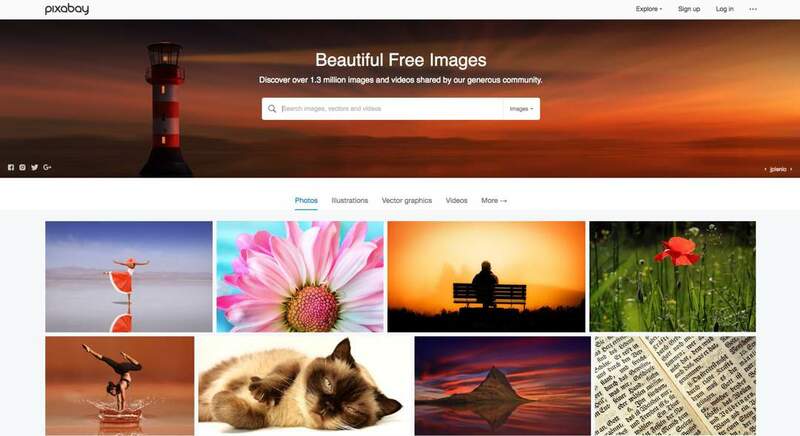 Hundreds of thousands of people use Flickr to store and share their photos every day – and there are literally millions of photos available to view. Unlike Unsplash and Pixabay, most of the photos on Flickr are NOT public domain or licensed for commercial re-use. When you search Flickr you can choose various licence options including “Any license”, “Commercial use allowed” and “Commercial use & mods allowed”. Before you use an image from Flickr, make absolutely sure that it has a Creative Commons licence that allows your intended use of the image. You can see a link to the licence for each image in a link on the bottom right of the screen. As anyone can upload their photos to Flickr, quality is a lot more variable than with the previous two – but if you’re struggling for a suitable image, Flickr often comes to the rescue. If you’re an expert in your area, you’ll be able to find lots of relevant and interesting resources to tweet. Simply go to Buzzsumo.com, enter a subject e.g. 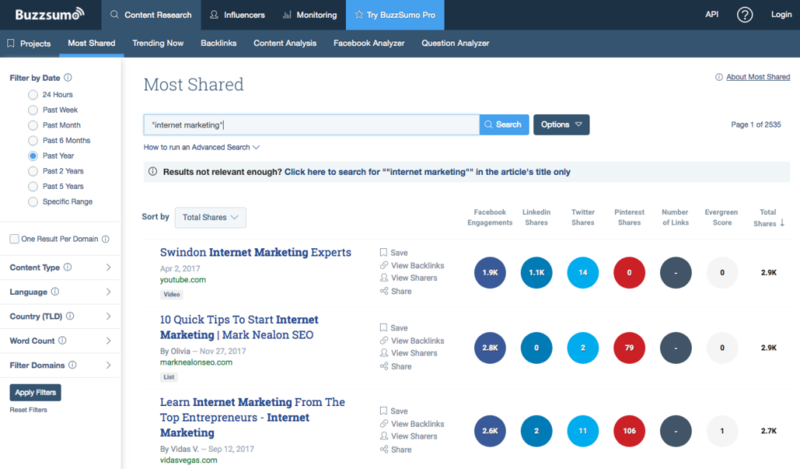 Internet Marketing, and Buzzsumo will return the most shared and linked articles on that subject. You can also enter a specific website to see the most shared articles from that site. Buzzsumo give you the top few results free of charge. If you search a few different terms, you’ll find plenty worth tweeting, but if you want to go into more depth, you can upgrade to Buzzsumo Pro for a monthly fee. For years, tweets were limited to 140 characters. This limit was originally introduced to make it easy to fit one tweet into a standard SMS text message. But in November 2017, Twitter doubled this limit to 280 characters, after their research showed that users were getting frustrated trying to fit messages into the old limit. So what is the perfect length for a tweet – and how does tweet length affect engagement? Research by Buddy Media shows that tweets with less than 100 characters boost engagement by 17%. TrackSocial.com have concluded that the perfect length for a tweet is around 100 characters. Research by Dan Zarella showed that tweets that include links perform best between 120 – 130 characters. The message seems to be that shorter tweets are better for engagement – so even though there’s a new limit – don’t give in to the temptation to use it all! 100 characters is a good rule of thumb – but it’s ok to go a bit longer if you need to, or if you’re including a link. People’s behaviour may change as they get used to seeing longer tweets, so we’ll be keeping an eye out for updated research in this area. Rather than just tweeting your article title, scan through it, looking for an interesting or controversial quote. You might get some feedback from people who don’t agree with you, but you’re much more likely to get re-tweets and engagement with controversial tweets. If you have any surprising facts or stats in your article – these can be a great thing to tweet, as they get people’s attention, arouse their curiosity, and make them more likely to click through to your article. Online Marketers know that telling someone exactly what you want them to do is the best way to get them to do it. If you only ever tweet your own content and links to your own website, your followers will probably get bored and unfollow you – or at least tune out your tweets. The easiest place to find other things to tweet is on Twitter itself. Scan down your feed, and when you find something that will interest your readers, re-tweet it. It only takes a second, and it will make your feed far more interesting to your followers, as well as helping you engage with the people whose tweets you are sharing. If you’ve followed a lot of people, you might struggle to find things worth re-tweeting in the noise of your feed. If so, check out the section on Twitter Lists which can help you focus on great sources for re-tweets. If you’re anything like me, you probably research and read quite widely in your market. Most days I’ll read some articles and analysis for the niches I’m involved with. So while you’re doing that – why not tweet the most interesting articles you find? It takes no time at all, and your followers will definitely appreciate your recommendations. I find that Buffer’s browser plugin is the fastest way to share articles on Twitter, but lots of other scheduling tools and plugins are available. If you can get more people to click the links in your tweets, that’s more traffic coming to your website. 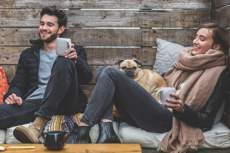 According to data published by Signupto.com, the average Click Through Rate varies between 6.16% for accounts with less than 1,000 followers, down to 0.45% for accounts with more than 10,000 followers. So how do you increase the number of people clicking your link? Dan Zarella found that links near the start of a tweet (about 25% of the way through) get more clicks than links at the end. Time of Day also has a big influence on CTR according to Signupto.com – with more than 16x as many people clicking through at 6pm, compared to the period between midnight and 6am. So make sure you’re tweeting when your audience is awake and available. Tweriod can help you find the best times to tweet. Don’t forget, Twitter is a Social Network, and it’s most effective when it helps people to connect. Occasionally sharing something personal, rather than just “business stuff” helps to show you’re a real human being, and promotes engagement. or if you’re running a marathon at the weekend, don’t be afraid to let your Twitter followers know. 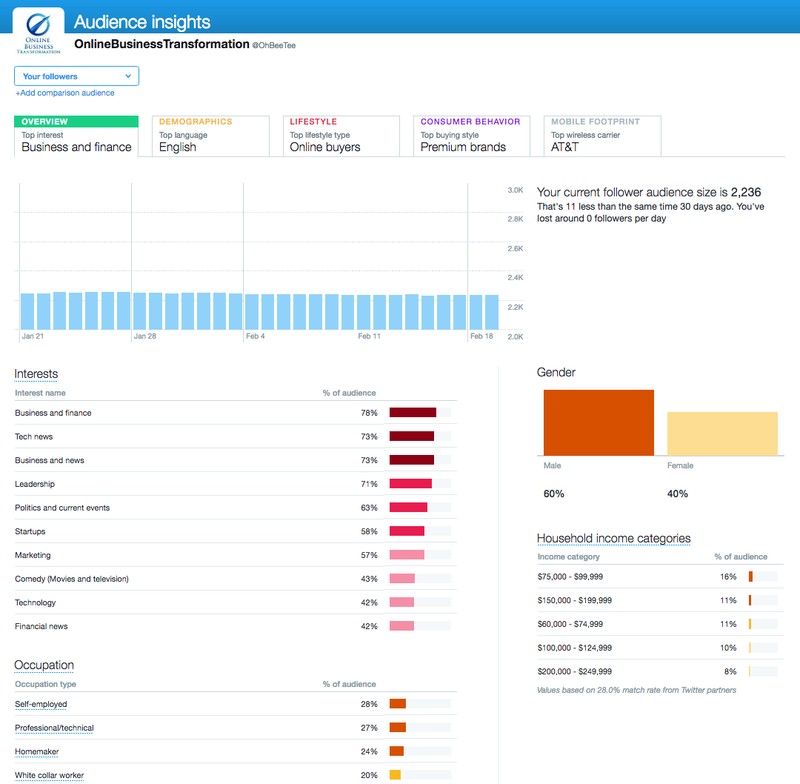 Twitter provides analytics for your tweets, so you can see how people are reacting to them. You can find Twitter’s analytics by clicking your account icon at the top of the page, and choosing “Analytics” from the menu. You’ll see a summary of the last 28 days’ activity. Choose “Tweets” from the Analytics menu at the top of the page, and you’ll see how your tweets have been performing for the last 28 days. You can choose a different period of up to 91 days from the date control in the top right – but you can’t see longer periods than that. 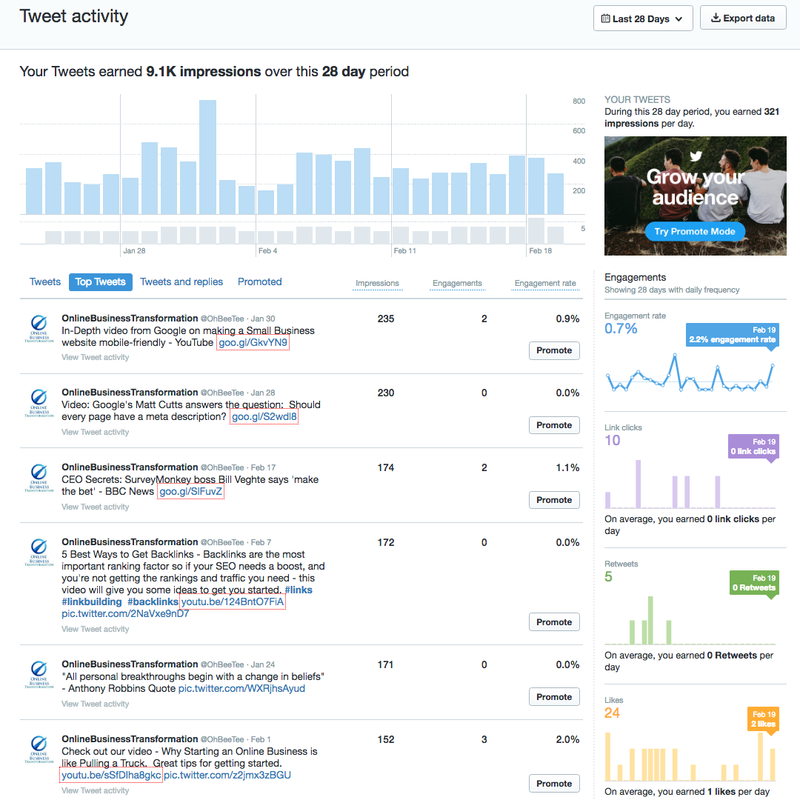 Click on Top Tweets to see the tweets that have gained the most impressions. 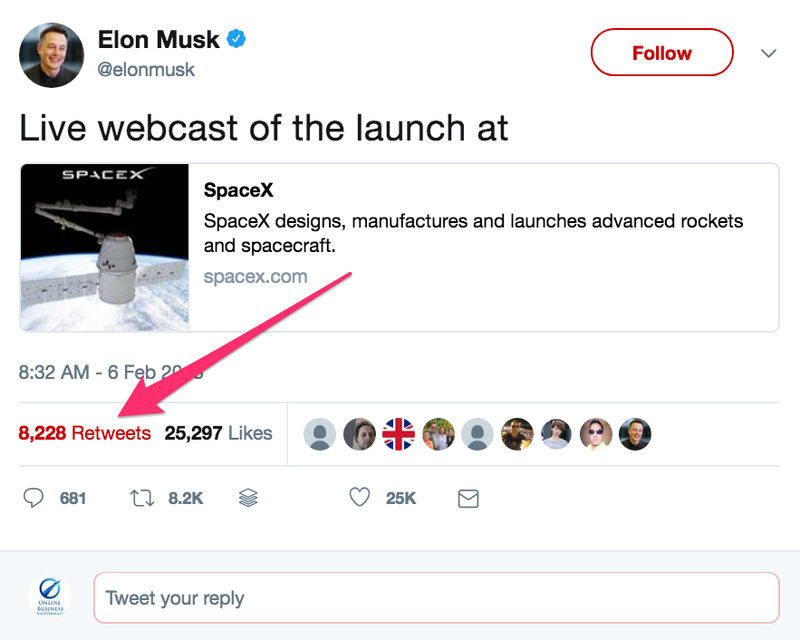 Unfortunately you can’t sort this list of tweets by engagements or engagement rate – so you’ll need to scan down the list manually to find the tweets that people have engaged with. Once you’ve found the tweets that are resonating with your audience, schedule them to be re-tweeted (if they’re still relevant). Some people will have missed them the first time round. (This is quicker and easier if you’re using the analytics within a tool like Buffer, as you can re-schedule them with a single click from the analytics screen). 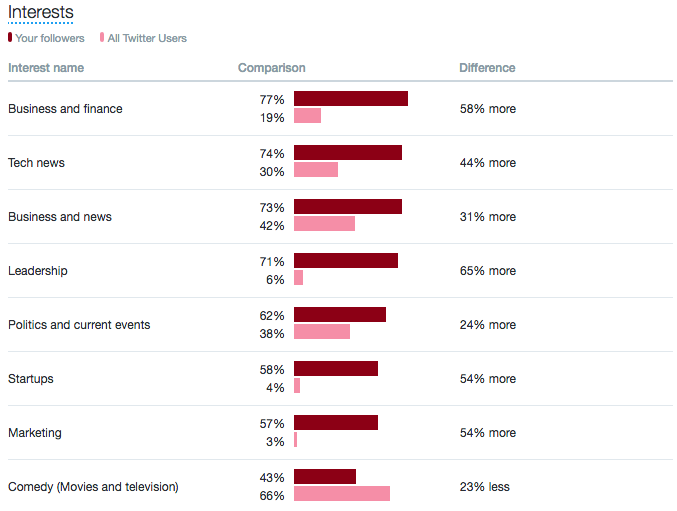 Twitter offers a very detailed demographic breakdown of your followers – and it’s well worth studying this to make sure you’re reaching the right people with your tweets. 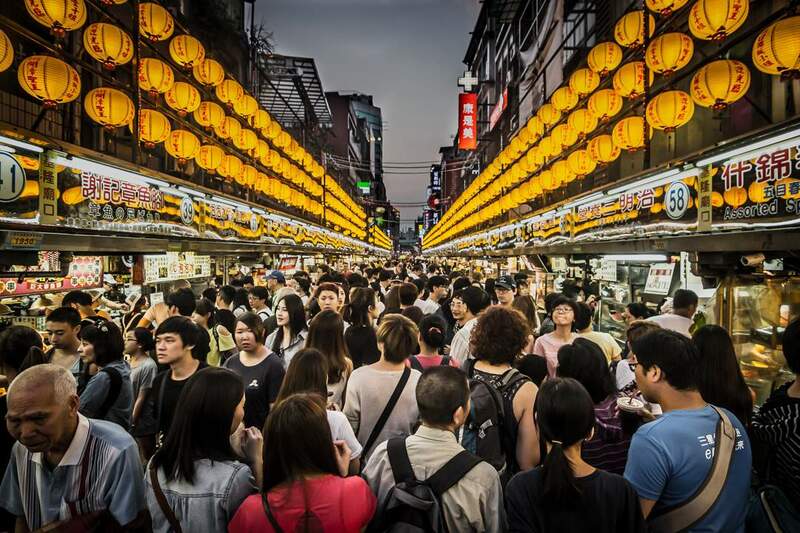 You should already have a good idea of who your ideal customers are, and the sort of people you’re trying to reach – so take a good look at this demographic information – and the more detailed information on the other tabs and see how it measures up. For example – looking at the Interests of our audience here on OBT, we can see that some of our top interests are Business and Finance, Tech News, Leadership, Startups and Marketing. That sounds pretty much like the Online Business Owners we’re trying to reach. 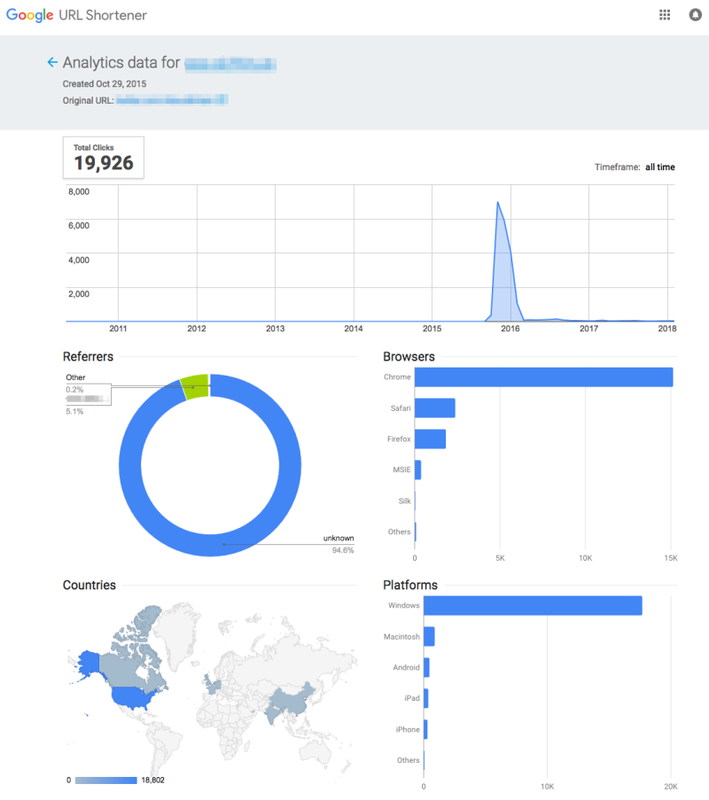 People interested in SEO are a prime audience for us – and I know it’s one of Twitter’s interest groups – but it’s not on this report, so I can take steps to connect with more people interested in that area via Twitter. 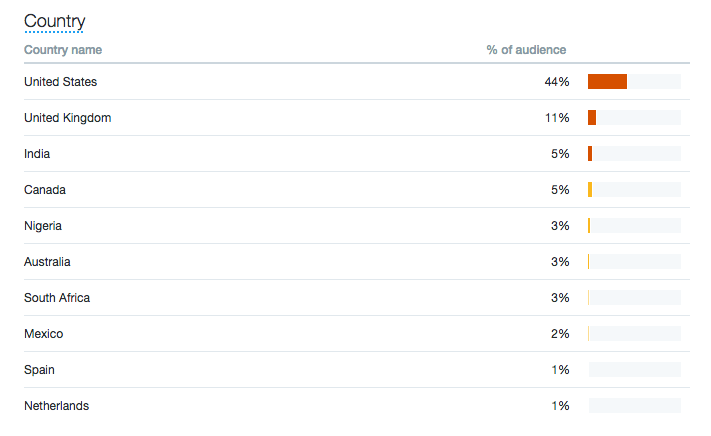 So our audience is clearly very different to the Twitter audience as a whole, and much more relevant to our niche. 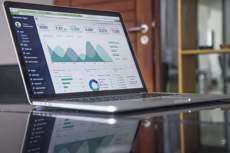 That’s good – it shows we’re reaching the right people – and you should see something similar for your market when you do this analysis for your own account. Now you’ve found your most popular tweets, analyse how these tweets are different. What subjects seem to be most popular? Do the popular tweets contain images? Video? Are they long or short? Do they have hashtags? Is there a link? A call to action? What times were your most popular tweets posted? Once you’ve done this analysis, try to write more tweets like the ones that are getting the greatest reach and engagement. That will be a big step towards growing your Twitter following, and the amount of traffic you get from Twitter. Go into the Demographics tab within Analytics, and check out the “Country” table. Now check the time zones of the countries where most of your audience members live – and make sure you schedule your tweets to go out when they’re awake and likely to be checking Twitter. This chapter has some great ideas to help you use Twitter and its features more effectively. Once you’ve followed a few thousand people on Twitter, you’ll probably start finding it difficult to pick out interesting tweets from your main feed – there’s just too much stuff, and it’s like trying to drink from a firehose. Twitter Lists allow you to create a group of Twitter accounts, so that you can see tweets from those accounts separately. You can create your own Twitter Lists, or subscribe to lists created by others. 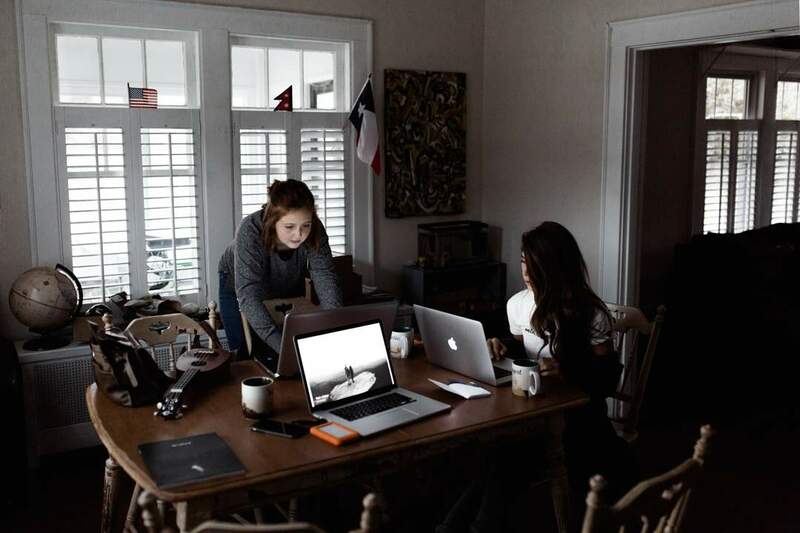 As Online Business Owners we’re naturally focused on trying to get our message out – and getting the attention of as many people as we can, and showing them what we have to offer. But if you just use Twitter to broadcast your message, you’re missing a big part of its power. You need to spend time listening to your customers and potential customers too. What are their problems and frustrations with existing products? What are they saying about your competitors? Are they having any customer service issues? What are people saying about your company and your products? 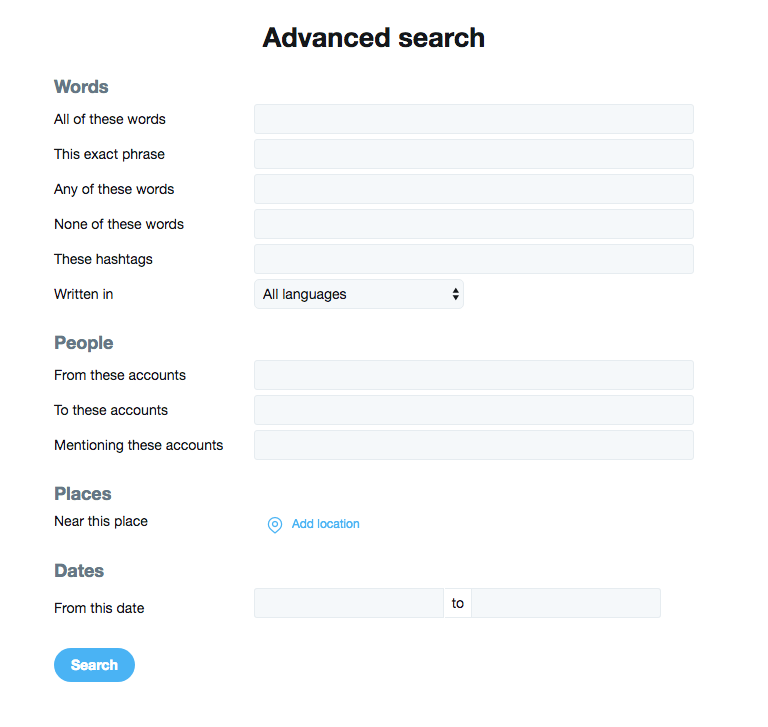 You can use Twitter’s Advanced Search feature, or its Search Operators to uncover all this information and more. (See the next two sections). 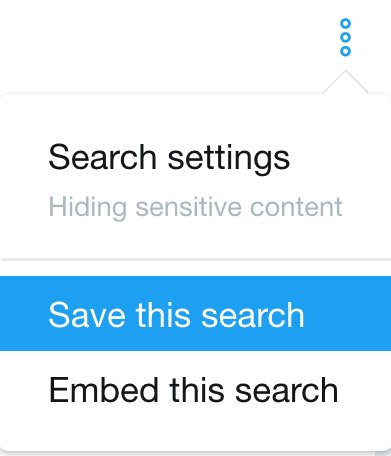 You’ll find Twitter’s basic search box at the top of every page. And if you’ve memorised all the available Search Operators, you can do everything from there. All of these words: Enter one or more words which must all appear in all the tweets returned (although they may appear in any order). This exact phrase: Returns tweets containing all the same words in the same order. Any of these words: Will return tweets containing at least one of the words you entered, but not necessarily all of them. None of these words: Tweets containing any of the words entered here won’t be returned. Ideal for filtering out irrelevant tweets from your results. These hashtags: Returns tweets containing ANY of the hashtags entered here. You don’t need to type the # symbol. Written in: A chance to choose which language you want returned. Very useful if you’re targeting non-english markets. From these accounts: Tweets sent from the accounts you enter here. No need to use the @ symbol. Handy for keeping an eye on competitors. To these accounts: Returns replies to the accounts you enter here. 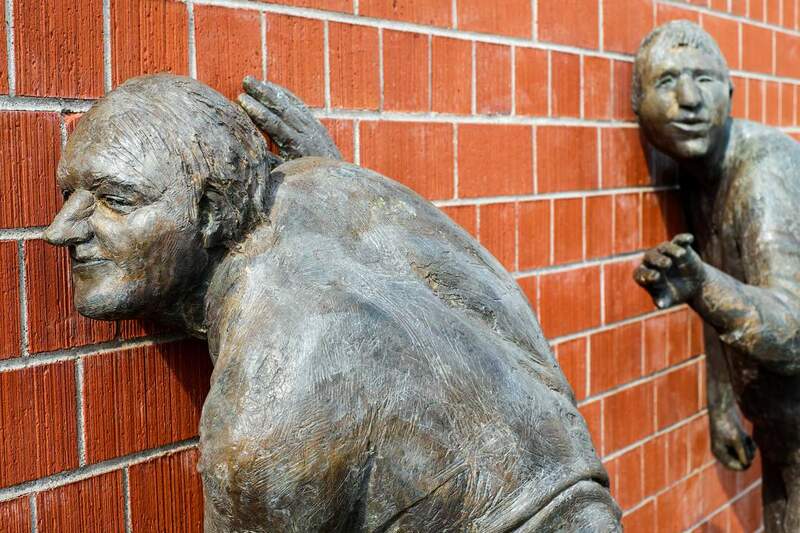 Useful for spying on competitors’ conversations, and finding people who engage with competitors – they might be good people to follow or mention to make them aware of you. Mentioning these accounts: Returns tweets that mention one or more of the accounts you enter here. You can use this to quickly check who’s mentioned you, or for competitive research. Near this place: If you’re running a local business, this is a great filter to add to your search so you can see who’s talking about your market in your local area. From / to this date: Allows you to see only tweets from a particular time. Most useful to return recent results, and find current conversations you might want to be part of. It goes without saying that you can fill in several fields, and combine search criteria to make complex and powerful search queries. 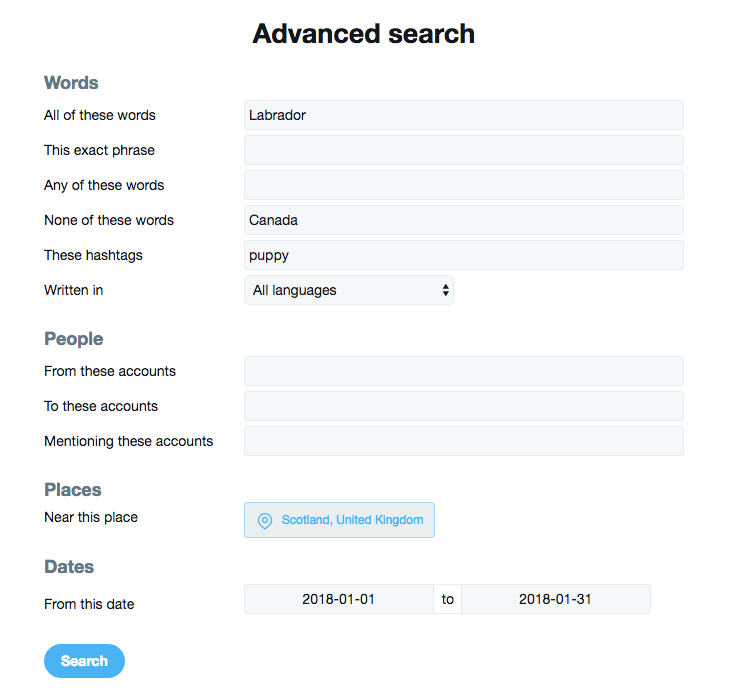 So for example you could search for all tweets containing the word “Labrador” but not containing the word “Canada” with the hashtag #puppy, in your location last month. You can access all of the advanced search features we’ve just looked at (and some powerful new ones) from the ordinary search box, if you know which search operators to use. Note: When you use search operators with a colon such as near: since: and until: make sure you don’t leave a space before or after the colon, or the operator won’t work. Simple, but very useful if you want to find frequently asked questions in your market, or engage with people by answering their questions. (instead of the smiley shown above just type a colon and a bracket). This is useful, but it’s just searching for tweets that use positive or negative emoticons similar to the one you searched for. There’s no analysis of the actual language used within the tweet. Use the filters on top of the search results to narrow your results. They’ll let you see only tweets with videos, tweets with photos, to search for people rather than tweets (useful to find people to follow), and more. Space is at a premium in a Tweet, so you don’t want to use valuable space with a long and unwieldy URL. There are lots of Link Shorteners to choose from – and the good ones will give you analytics showing how often the link has been clicked. They’ll even let you re-direct the link to a different page in future. Bit.ly – The original Link Shortener – but sometimes adds its own affiliate codes to your links, so not suitable for affiliate marketers because they’ll get the commission, not you! PrettyLinks.com – If you run WordPress and prefer not to outsource your link shortening to a third party service, check out PrettyLinks – a WordPress plugin that will let you create short versions of links on your own domain. PrettyLinks has lots of advanced features including different redirect types and even split testing support. Obviously it makes most sense if your domain is already quite short. Keep an eye on your notifications to see when you’ve been mentioned. Alternatively, search for your Company Name or Product Names, or search for your domain name. You can also search for your Twitter username without the @. One of the best ways to get more out of Twitter is simply to get your tweets seen more often. When more people see your tweets, you’ll get more followers, more traffic and more engagement. A question I’m often asked is: How often should I tweet? And the short answer is – It depends on how much you have to say. That might sound trite – but there’s a serious point: Tweeting more often is a good thing, but only if quality doesn’t suffer. Your tweets have to be interesting and relevant to your audience, otherwise people will stop paying attention to you, and you’ll lose followers. Every tweet you send that links back to an article on your website, is an opportunity for someone to click through – and that’s another visitor. But if you only have five articles on your site – there’s a limit to the number of tweets you can send pointing back to those five articles before your followers get bored seeing them. If you have 500 articles on your site, then obviously you have a lot more scope for creating different tweets that link to those articles, and you can tweet a lot more often without annoying your audience. In either case, I’d suggest not just sending tweets that link back to your own stuff – mix it up by tweeting interesting and relevant news items in your market, links to other people’s best articles and re-tweeting interesting tweets from people you follow. That way you’re serving your followers by creating an interesting and balanced feed of information they’ll enjoy – and they’ll be happy for you to tweet more often. Aim for a minimum of 5 tweets per day – 1 to your own website, and 4 others. If you have a larger site, with lots of content, go for 10 tweets per day, perhaps 3 to your own stuff, and 7 others. Once you have a very large site, with a huge amount of interesting content to share, you can try increasing these numbers, to 15 or even 20 tweets per day, and see how that affects your traffic and follower count. It’s worth testing different approaches – for example Neil Patel has successfully tested tweeting as often as 40x per day! But then Neil has a huge amount of content to share, so what works for him might not work so well for everyone. If you’re tweeting many times per day, make sure your tweets are spread out throughout the day, rather than all landing at once. A scheduling tool like Buffer makes this easy. Most people have so many tweets coming in every day, they only see a fraction of them, and that means if you only tweet something once, most of your followers will probably miss it. So it’s OK to send a tweet out two or even three times to maximise the number of people who see it. I don’t recommend doing this for every tweet, as it could become annoying for people who don’t follow many accounts, as they may see every tweet you send. If you’re promoting a great new article that you’ve put a lot of effort into, or a special offer, then it makes sense to tweet it several times. If you’re nervous about doing this, you might want to use the same link, but change the image, or slightly tweak the text, so each tweet is slightly different. Take into account how timely the tweet is – a tweet about an event or special offer will have a short life, and you’ll need to tweet it only 2 or 3 times over a short period. But if you’re promoting an evergreen article, you could tweet it a lot more often – but over a much longer period of time. If you have an active Twitter account, it wouldn’t do any harm to re-send a few of your “Top Tweets” every month or so. Provided they’re high quality, and mixed in with plenty of fresh tweets, it won’t cause any problems. Don’t forget that if your Twitter account is growing, your newer followers will have missed these tweets the first time around – so they’ll be completely fresh for some people. Have you got a particular tweet that you’d like to be the first thing people see when they visit your Twitter page? If so, why not pin it to the top of your feed? All you need to do is click on the “down arrow” at the top right of the tweet, and choose “Pin to your profile page” from the menu. Getting more ReTweets is a great way to get your tweets seen by more people. And the best way to get more ReTweets is simply to ask. Just include “Please ReTweet” or “Please RT” in your tweets. But which request works better? And how much difference does it make anyway? So that’s a clear win for “Please ReTweet”. Dan did another study and found that including an image made your tweet nearly twice as likely to be ReTweeted. Dan has also shown that tweets with Hashtags get 55% more ReTweets than tweets without. According to this data, if you add at least one hashtag, an attractive image and a “Please ReTweet” to your tweets, you can expect to get a lot more ReTweets. Adding hashtags to your tweets is a great way to reach new people. 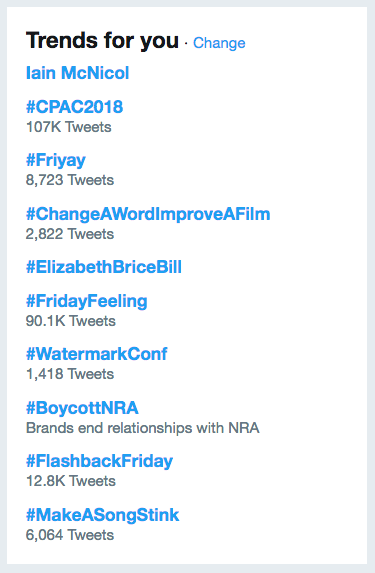 Twitter shows trending hashtags on the left hand side of the screen. Using one of the trending hashtags in your tweet will help you reach a lot of people. But you can’t just add a trending hashtag to an unrelated tweet. That would be spam, and you’d get a very bad reaction from Twitter users. You need to join in the conversation. The secret is to be creative, and find ways to link your business or your market naturally into one of the trending conversations. Keep an eye on the current trends and look for opportunities to join the conversation. 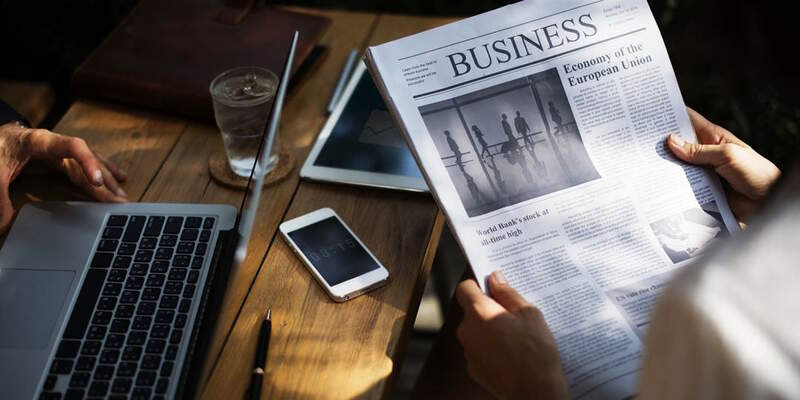 Newsjacking has always been a favourite PR tactic: You find out what’s newsworthy and popular right now, and find an angle that lets you promote your business by tapping into that conversation. Trends24 lets you see what’s being talked about right now, in lots of countries – and even down to city level. Participating in (but not spamming!) these conversations will help you get seen by lots more people, and if you’re cool and interesting, you’ll pick up new followers too. If your tweet is relevant to a particular city, then using the name of the city as a hashtag often gets attention from local people, and sometimes even local media. There are lots of hashtags that are often used, but aren’t necessarily trending at the moment. How do you find popular hashtags? Perhaps you can think of a few hashtags you might use, but you’re not sure which one is the most popular. Or perhaps you’re stuck for ideas. RiteTag will show you the relative popularity of different hashtags so you can target the most popular ones and reach more people. It will also show you related hashtags that you might not have considered, as well as data on how often each hashtag is being used, retweeted, used with images etc. The basic version of RiteTag with all the information I’ve mentioned is free to use. 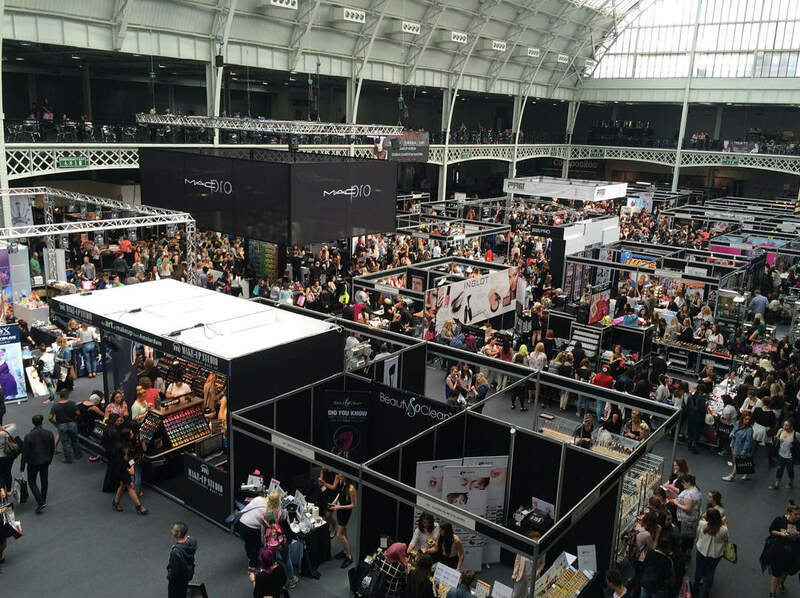 If you’re planning to attend a conference, seminar, trade show or product launch that you think many of your Twitter followers would be interested in, then why not live-tweet from the event? If the event has an official hashtag – make sure you use it, so that your tweets reach people who are interested in (or attending) the event. So what can you tweet from an event? Photos, video, good quotes from speakers or industry figures, answers to questions about the event – there are lots of possibilities. Don’t forget all your followers will be seeing your tweets – not just other people attending the event, or people who wanted to attend – so try to make sure your tweets provide value to your whole audience. 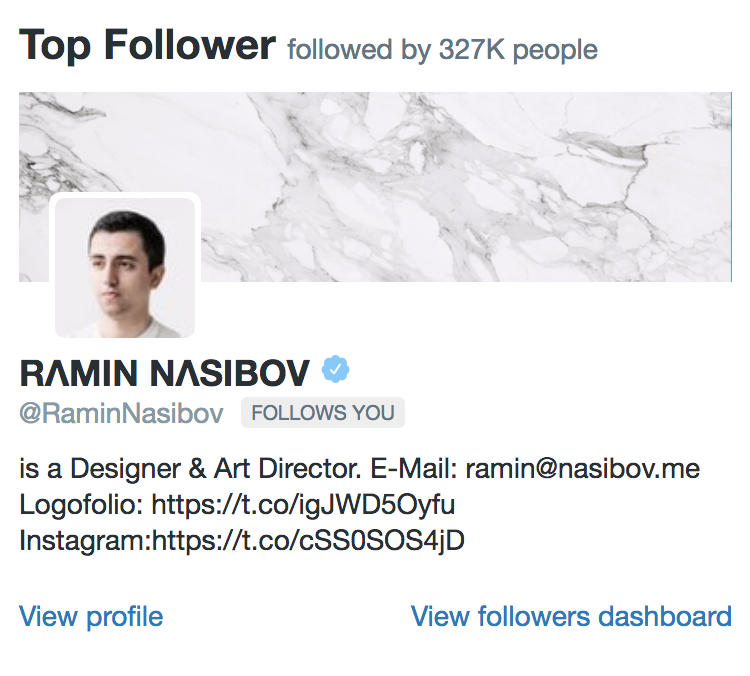 One of the best ways to build your following on Twitter is to follow other people – because some of the people you follow will follow you back. But to prevent spammers just following millions of accounts, Twitter limits you to following 1,000 people per day – which is more than enough for legitimate users. There’s also a limit on the total number of people you can follow: You’re allowed to follow 5,000 people, and then you’re limited as to how many more people you can follow, based on the ratio between the number of people you’re following and the number of people following you. 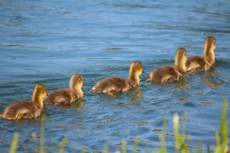 Follow people who follow your competitors – they’re more likely to follow back. Simply go to a competitor’s profile, and click on “Followers” to see a list of their followers. Don’t just blindly follow them all though – look for people who’ve uploaded a profile photo – and written a decent description. 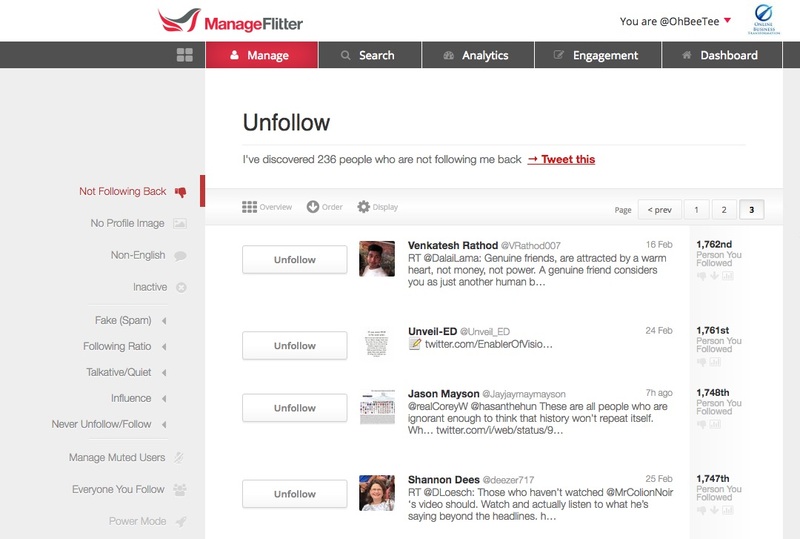 Check out tools like Tweepi and ManageFlitter which can help you find relevant people to follow. People who re-tweet your competitors tweets, are likely to re-tweet your tweets too – if you can get them to follow you. So it makes sense to find these people and follow them – in the hope they’ll follow you back. Some of the people you follow will follow you back – but many won’t. Eventually you’ll need to unfollow some people who aren’t following you back, or Twitter will stop you following any more people. Just look at your “following” list, scroll down to find the oldest ones, and unfollow some of the people who haven’t followed you back. Tools like ManageFlitter or Tweepi can help with this process. Don’t aggressively follow and unfollow huge numbers of people just to build followers – it’s against Twitter’s terms of service and can get your account suspended or even banned. But 5 minutes a day spent managing your following and followers will help you build followers steadily over time. Make sure you have a “Follow Us on Twitter” button clearly shown on your website. Most website visitors visit once, and never come back. Make it easy for them to follow you on Twitter, and you’ll be able to remind them you exist, and bring them back with interesting tweets and even special offers. As well as a button asking people to follow your account, you should make it easy for people to share your best content on Twitter. 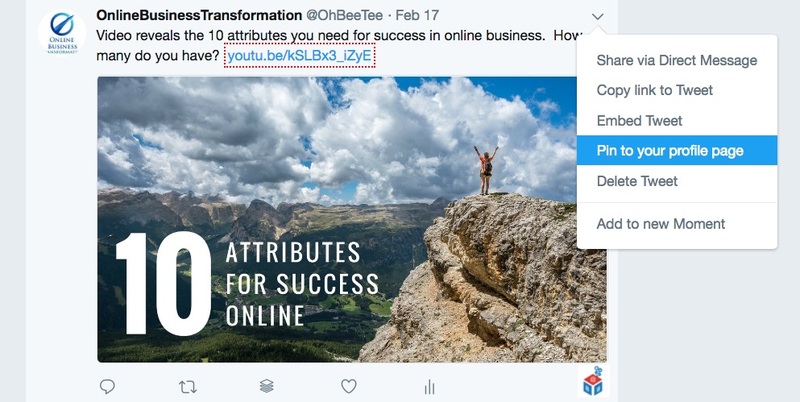 If you add a “Share on Twitter” button to each blog post, it makes it easy for your visitors to share it with their followers – and some of them will want to follow you on Twitter to get more of your great content. Or if you use WordPress, there are lots of Social Media plugins such as “AddThis” or “AddToAny” that make it easy to put Twitter and other Social Share and Follow buttons on your blog. Simply choose Plugins and Add New from your WordPress Dashboard – then search for Social Sharing and choose a plugin that appeals to you. You can choose tweetable quotes in your blog posts, and provide a “Click to Tweet” button which does just that. What’s a “tweetable quote”? Anything memorable, inspiring, controversial or newsworthy that you want people to share. Go to Plugins -> Add New from your WordPress Dashboard, and search for “Better Click to Tweet”. 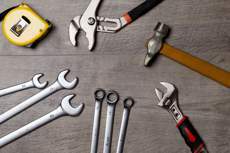 Install and configure the plugin for your site – and you’re ready to go. Growing your audience by getting more followers is important, but don’t obsess about the number of followers you have, at the expense of the quality of the relationship you have with them. An engaged and responsive list of a few hundred followers is better, and much more valuable, than a list of thousands who ignore your tweets altogether. So let’s look at some ways to improve interaction with your followers, and build a community with your Twitter account at the centre. If someone mentions or retweets you on Twitter, reach out and thank them. As well as being good Twitter etiquette – it’s a chance to build a stronger connection with someone who appreciates what you’re doing. If you want to spark some interaction with your followers, try tweeting a question and asking for their opinion. Choose questions related to your market, that are likely to be interesting or even slightly controversial. When people answer your question – that’s a great opportunity to engage with them by replying to their answer and thanking them. If you’re stuck for ideas – try searching for terms related to your market and “#questions” to see what other people are asking. 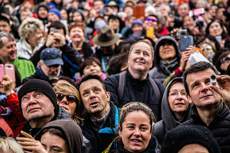 While you’re there – why not answer a few and get noticed that way? People love being asked their opinion – it makes them feel that you care about them and value their point of view. A poll is also a great way to do some quick market research, get feedback on product ideas, and find out more about your followers. One of Twitter’s unique strengths is that it allows you the chance to get noticed by, and interact with, big name influencers in your niche – even if you’re still an unknown. When you mention someone in a tweet (by including their @username), your tweet will appear in their notifications tab, even if they’re not following you! (All your followers will see the tweet too). 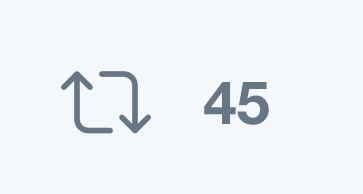 When you reply to someone’s tweet (by clicking “Reply” or having their @username as the first thing in your tweet), that will also appear in their notifications tab – even if they’re not following you. But only people who follow you and the person you replied to will see your tweet. Of course not everyone sees every notification on their account – but Twitter gives you a chance to interact with “big names” who you’d struggle to reach any other way. A twitter chat is a group that meets at a certain time to discuss a particular topic. The host will have chosen a hashtag, and all participants use that hashtag so they can find all the tweets in that chat. Typically the host will lead the discussion, and can ask questions (Q1. Q2. Q3 etc), and participants will respond with their answers labelled (A1. A2. A3). Twitter chats are a great way to network with others interested in your niche. You should find lots of people with interesting things to say that you’ll want to follow – and if you make a good impression, you’ll usually get some new followers as well. You can find twitter chats to participate in by searching Tweet Reports or Twubs. If you participate in Twitter Chats regularly, you might want to check out some tools designed for the purpose, such as Tweetchat, although Hootsuite and Tweetdeck are also very useful. 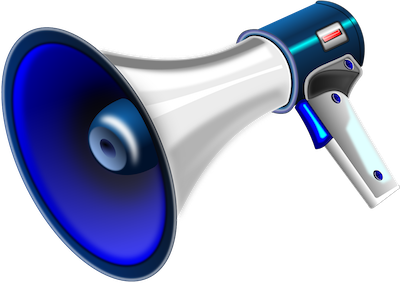 Don’t forget your tweets will be going to all your other followers too – so you might want to tweet a “High Volume Warning” first. Stay positive, don’t get drawn into arguments, and don’t try to spam the chat with your sales pitch – just let your expertise become obvious by adding value to the chat. If you’re a regular participant in Twitter Chats, the next logical step is hosting one of your own. You’ll need to choose the Hashtag – so make it something short and memorable. If you’re planning to make your chat a regular feature, then submit it to Twubs, Tweet Reports and any other directories of Twitter Chats – so that people can find you. 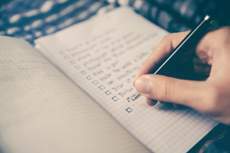 You don’t need to plan a chat in too much detail – they can be quite fluid things – but you should have an outline of the subject you want to focus on, and a few questions to get things going. 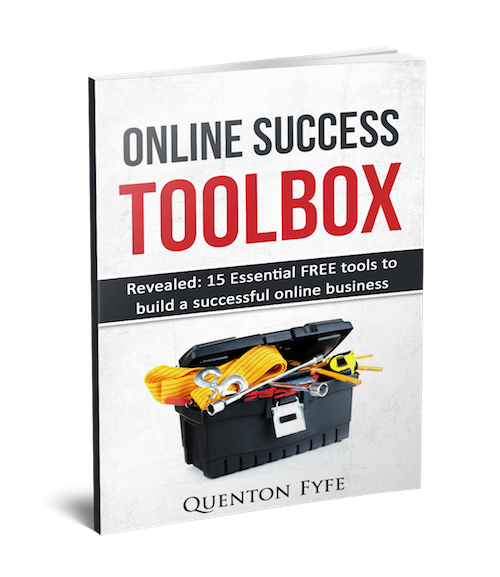 There are literally hundreds of tools on the market that can help with all aspects of running your Twitter account, from dashboards to post scheduling, finding influential users, following and unfollowing and lots more. 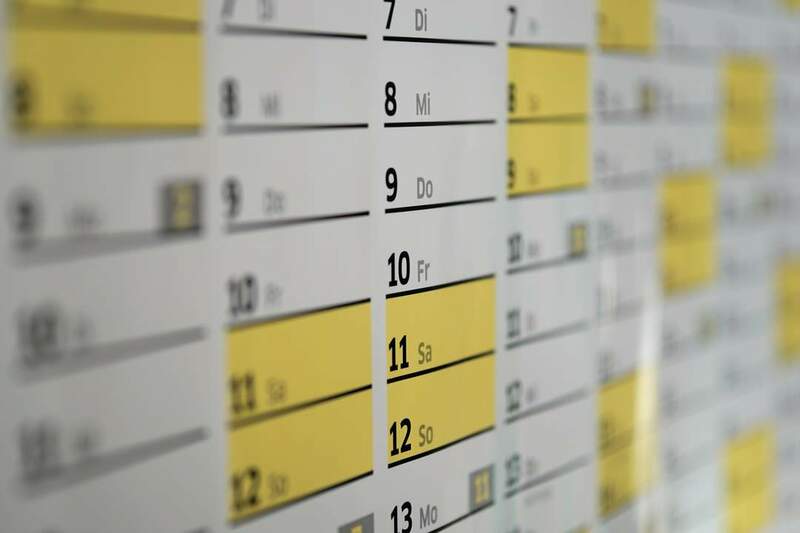 It’s important to use a scheduler with Twitter, because dumping 5 or 10 tweets into your timeline at the same time will get a poor response – many people will miss them altogether, and others can be annoyed at getting so many tweets at once. But it’s too time consuming to keep going into Twitter every half hour throughout your day and finding something new to tweet. 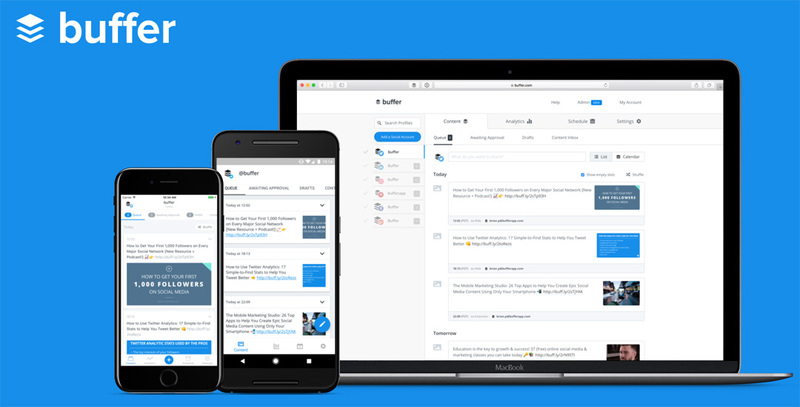 Buffer makes it easy to schedule tweets so that they are posted evenly throughout the day, or at the times your audience is most likely to engage with them. 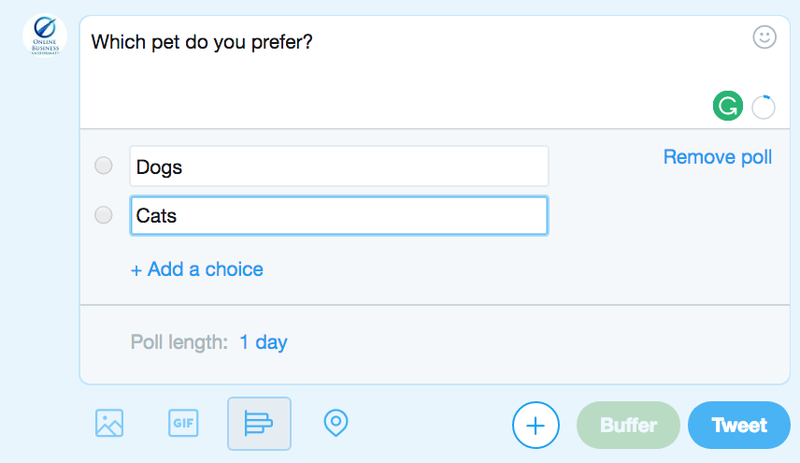 There are lots of schedulers out there – but Buffer has browser plugins and a streamlined interface that make it really fast and easy to schedule new tweets when you find something worth sharing. There’s a free version that supports one account for each of Twitter, Facebook, LinkedIn, Instagram and Google+, and will let you schedule 10 posts for each – so you may never need the paid version at all. 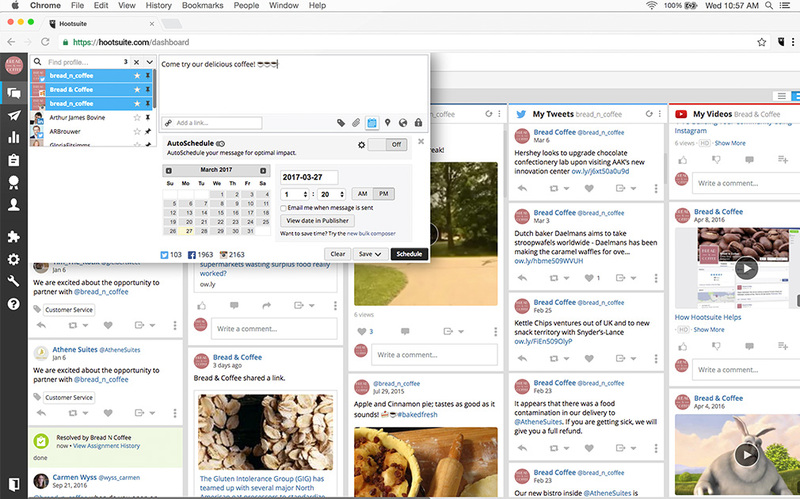 Hootsuite is a social media dashboard that will let you manage your accounts on all the most popular social networks. 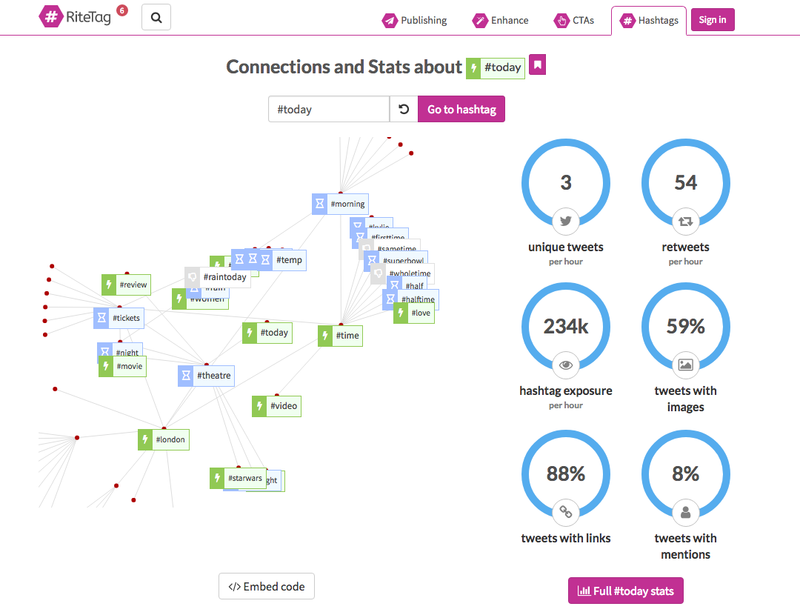 The tool is especially good for monitoring the activity on your Twitter account, as you can organise your account into several tabs, so you can see at a glance who has mentioned you in a tweet, you have a tab of messages sent to you, a tab of tweets you have sent, a tab for your favourite sources etc. This makes it easier to see all the activity on your Twitter account, and to interact with people, and be much more responsive, which is great for engagement and for building a loyal following. There are lots of advanced features for working with teams – but you can get started with a free trial, which might give you everything you need. If you’re looking for a dashboard just for Twitter – and you’re not bothered about other social media accounts, then try TweetDeck. Like Hootsuite, Tweetdeck also lets you organise Twitter into columns, so you won’t miss retweets, replies, messages or other account activity. Tweetdeck used to be a stand-alone service – but Twitter liked it so much they bought it. TweetDeck only supports Twitter – but it’s completely free, so it’s worth taking a look. To give it a try, just click the link below and you’ll see the TweetDeck dashboard for the Twitter account you’re currently logged in to. One of the problems with Twitter is that most people only see a fraction of all the tweets in their feed – so your carefully crafted message is probably missed by most of your followers. 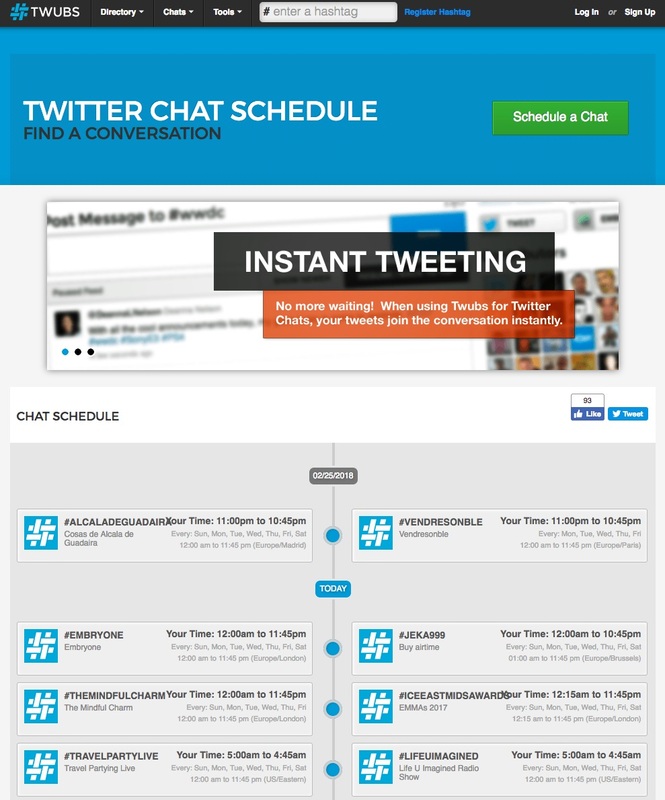 One solution is to send your tweets more than once – but that can quickly become cumbersome, even with a scheduler. 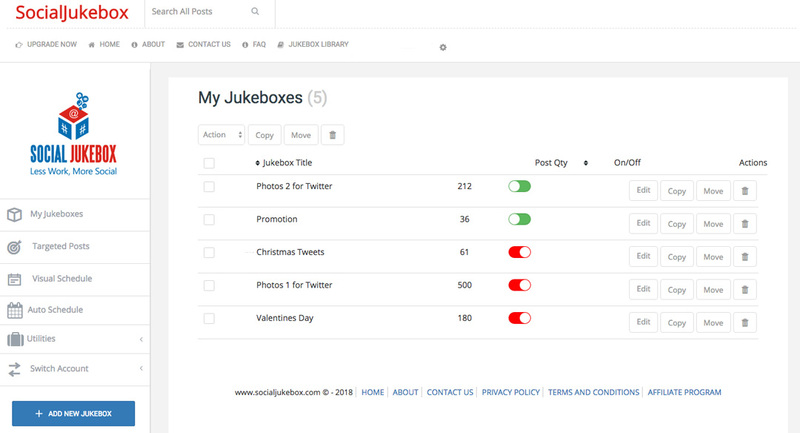 With Social Jukebox you organise your tweets into “jukeboxes”, and the system will then post them automatically for you according to the schedule you set up. But the thing that’s different to most other schedulers, is that once it’s posted all your tweets, it cycles round and starts posting them again. You can load hundreds of different tweets into a jukebox, create several jukeboxes, each of which can be switched on and off at will. You can create seasonal jukeboxes, jukeboxes by subject, or whatever makes sense in your market. If you have lots of tweets and you organise things properly, your followers won’t get bored seeing the same tweets over and over again – and you’ll spend a lot less time posting on Twitter. Once you’ve chosen a scheduler – you still need to find out the best time to tweet – when most of your followers are active. Tweriod can tell you. 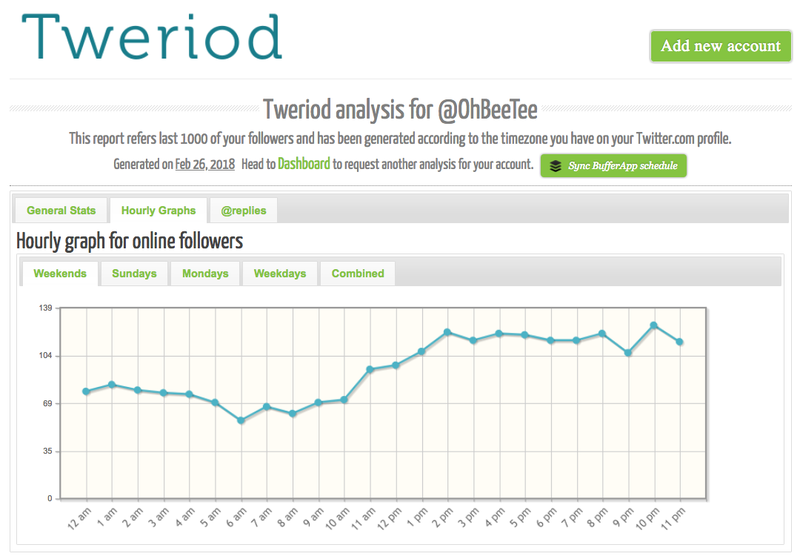 Just create a free account, and Tweriod will analyse up to 1,000 followers, and report the best time to tweet to get their attention. One of the best ways to increase your Twitter following is to follow more people who might be interested in your tweets. But Twitter impose limits on how many people you can follow to stop people abusing the system: After you’ve followed 5,000 users, there’s a limit on how many more you can follow until you get more followers yourself. So it makes sense to manage your account carefully and make sure there’s a balance between the number of people you’re following, and the number of people following you. ManageFlitter can help you do this, by identifying users who are not following you back, haven’t uploaded a profile image or are inactive. You can then choose whether you want to unfollow any of them, to allow you to follow some other people instead. The tool has a range features to help you find and follow relevant accounts too. 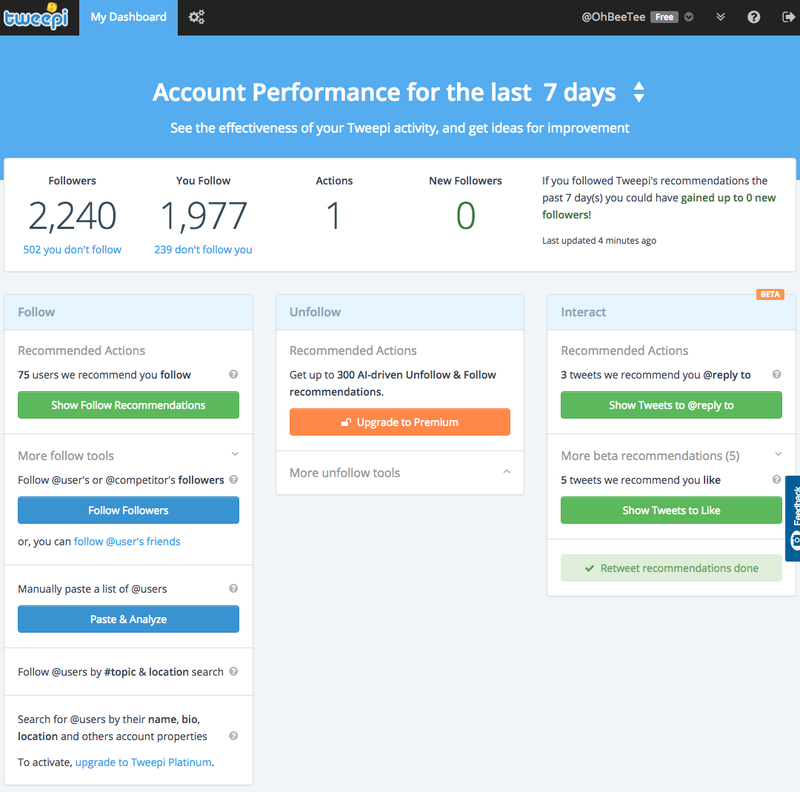 Tweepi claims to use artificial intelligence to help you manage your Twitter account. There are features to help you find and follow the most influential users relevant to your market. Tools help you find the most sociable and active people, interested in the same subjects as you. The tool will also suggest people you might want to unfollow because they’re inactive. 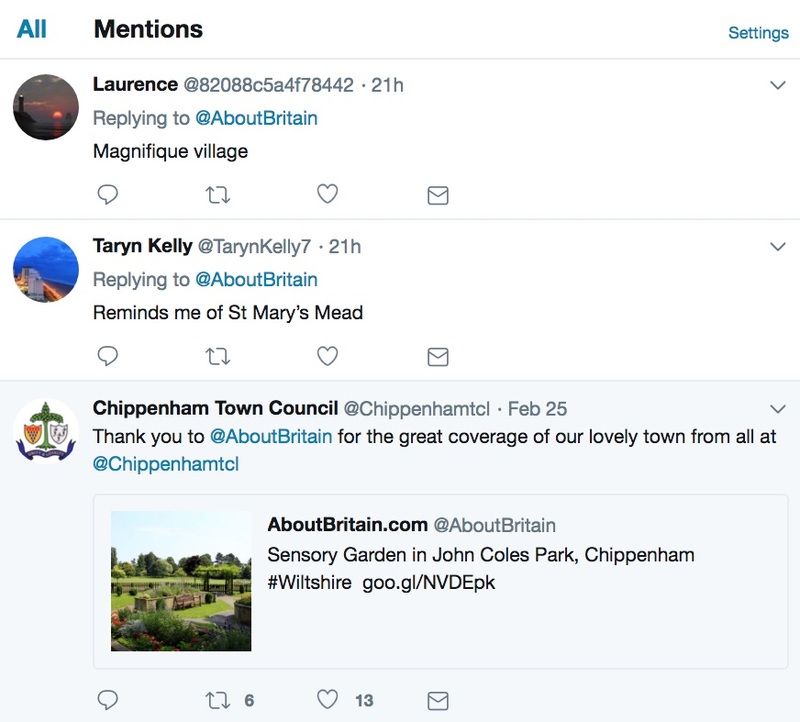 Tweepi can even find and suggest tweets for you to like, retweet or reply to – helping you to be a sociable and engaged member of the community – and still be efficient. 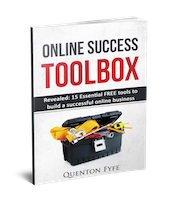 This is a paid tool – but has a free version available so you can get a taste of what’s on offer. Twitter can be very time consuming, so it’s good to automate as much as possible, provided the quality of what you’re sharing doesn’t suffer. 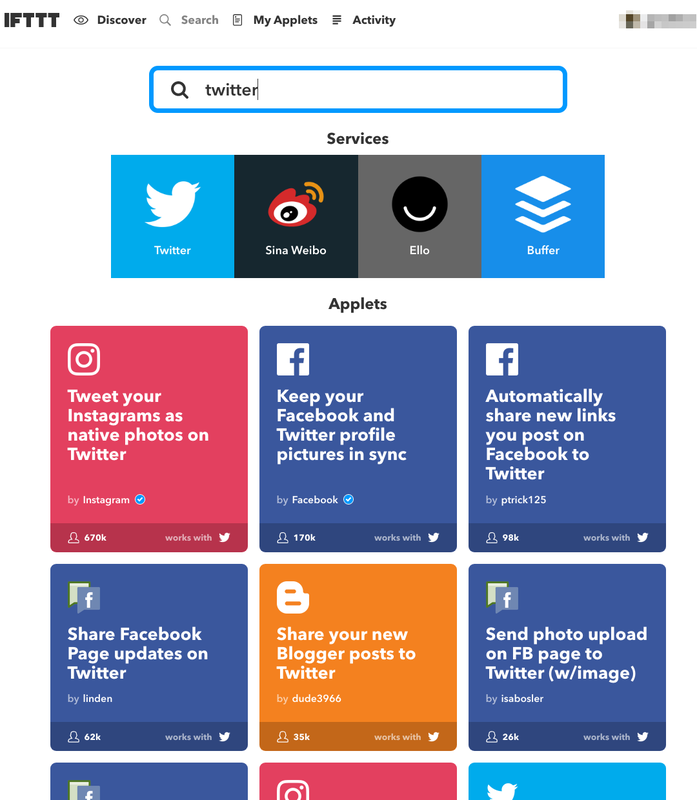 IFTTT (which stands for “If This Then That”), is a great automation tool that can help you keep your Twitter account updated with a minimum of extra effort on your part. We’ve covered a lot of ground in this article – more than 50 tips and tools to help you use Twitter to market your business effectively. If Twitter is an important part of your marketing mix (or you would like it to be), I recommend setting aside a few minutes every day to work on your Twitter presence. Make use of these tools, tips and ideas, and your Twitter account will soon be growing quickly and helping you reach lots of new customers. What was your favourite tip? Do you have a cool Twitter tip to share? If so – let me know in the comments below – I’d love to hear from you! This really is The Ultimate Guide to Using Twitter for Business! 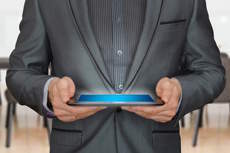 Great information every business owner needs to know! Thanks Aric – glad you enjoyed it! This is really helpful! I’m active on Facebook but I get easily overwhelmed by other social media platforms. I also have trouble writing short tweets. This is a great guide for someone like me! Thanks for commenting Kate. It’s useful that Twitter have raised the maximum tweet length – but shorter tweets are still worth aiming for. I’m impressed by your ultimate guide. Absolutely amazing work. But, if you can, please add the Crowdfire to this too. It is one of the best Twitter tools. I have been using Twitter for almost eight years and got 135k+ genuine followers. I should give credit to Crowdfire and Tweepi for doing that. I’ll surely share this with my social media followers. I think I have Crowdfire installed on my phone – but I haven’t really used it much, so it’s interesting to hear you’ve had so much success with it. (Congratulations on 135k followers!). I’ll definitely consider including it the next time I update this article.